Our product range includes a wide range of abrasive blast equipment, sandblasting equipment, blasting machine, shot blasting machines, portable abrasive blasting machine and shot blasting equipment. We are the leading supplier and trader of all kind of Abrasive Blast Equipment. We offer Abrasive Blasting Machine. These Abrasive Blast Equipment manufactured using the finest grade raw materials procured from our trusted vendors in the market and are strictly in compliance with the prevailing industry standards. Our range is available in different capacities based on the requirements of our clients. We are the leading supplier and trader of all kind of Blasting Machine. We offer Blasting Machine. These Blasting Machine manufactured using the finest grade raw materials procured from our trusted vendors in the market and are strictly in compliance with the prevailing industry standards. Our range is available in different capacities based on the requirements of our clients. We are the leading supplier and trader of all kind of Shot Blasting Machines. We offer Shot Blasting Machines. These Shot Blasting Machines manufactured using the finest grade raw materials procured from our trusted vendors in the market and are strictly in compliance with the prevailing industry standards. Our range is available in different capacities based on the requirements of our clients. We are the leading supplier and trader of all kind of Portable Abrasive Blasting Machine. We offer Abrasive Blasting Machine. These Portable Abrasive Blasting Machine manufactured using the finest grade raw materials procured from our trusted vendors in the market and are strictly in compliance with the prevailing industry standards. Our range is available in different capacities based on the requirements of our clients. We are the leading supplier and trader of all kind of Shot Blasting Equipment. We offer Abrasive Blasting Machine. These Shot Blasting Equipment manufactured using the finest grade raw materials procured from our trusted vendors in the market and are strictly in compliance with the prevailing industry standards. Our range is available in different capacities based on the requirements of our clients. We are the leading supplier and trader of all kind of blasting equipments. We offer Abrasive Blasting Equipment. These blasting equipments are manufactured using the finest grade raw materials procured from our trusted vendors in the market and are strictly in compliance with the prevailing industry standards. Our range is available in different capacities based on the requirements of our clients. 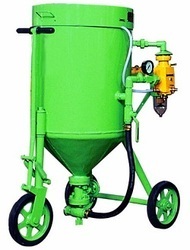 We are the leading supplier and trader of all kind of Abrasive Blasting Machine. We offer Abrasive Blasting Machine. These Abrasive Blasting Machineare manufactured using the finest grade raw materials procured from our trusted vendors in the market and are strictly in compliance with the prevailing industry standards. Our range is available in different capacities based on the requirements of our clients. Looking for Blasting Machine & Equipments ?